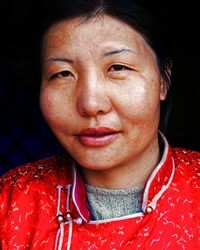 The Mongols - who consist of "as many as sixty separate Mongolian tribes" - are one of China's official nationalities. The main Mongol language in China is similar to Hahl Mongol in Mongolia, "but there are phonological and important loan differences." In the thirteenth and fourteenth centuries the Mongols brutally established the largest empire the world has seen, stretching from Southeast Asia to Europe. They instituted the Yuan Dynasty and ruled China from 1271 to 1368. The terrified Europeans called the Mongols Tatars, meaning "people from hell" (Tartarus). Through thousands of bitter winters the Mongols have lived in yurts, racing their horses, raising livestock, and worshiping the forces of nature. At the mercy of their vast and windswept landscape, the ancient Mongols based their religion on the forces of nature. The moon, stars, and sun were all revered, as were rivers. In the past many Mongols were Christians, converted by Nestorian missionaries between the seventh and fourteenth centuries. Even a chapel outside the Great Khan's royal tent "resounded with the sound of public chants and the beating of tablets loudly announcing the appointed hours of Christian worship." Hulagu Khan's wife was described as "the believing and true Christian queen." The Keirats, a Mongol tribe, numbered 200,000 believers in AD 1007, while there were about 30,000 Mongol Catholics recorded in China by 1368. At times during the thirteenth and fourteenth centuries it seemed that the Mongols were on the verge of adopting Christianity as their religion. Kublai Khan issued this challenge to Marco Polo: "Go to your Pope and ask him to send me a hundred men learned in your religion, who in the face of these sorcerers will show their mastery by making the sorcerers powerless to perform these marvels in their presence. Then I will be baptized, and all my magnates and barons will do likewise, and their subjects in turn. Then there will be more Christians here than there are in your part of the world." In 1992 there were about 2,000 Mongol believers reported in China. Today there are believed to be between 5,000 and 12,000. In 1998 a German-based ministry claimed at least 200,000 Mongol Christians in China. This has been strongly challenged by people close to the situation who say this source is unreliable and the claims are grossly exaggerated. The size of the Mongol church in China has long been a matter of dispute. 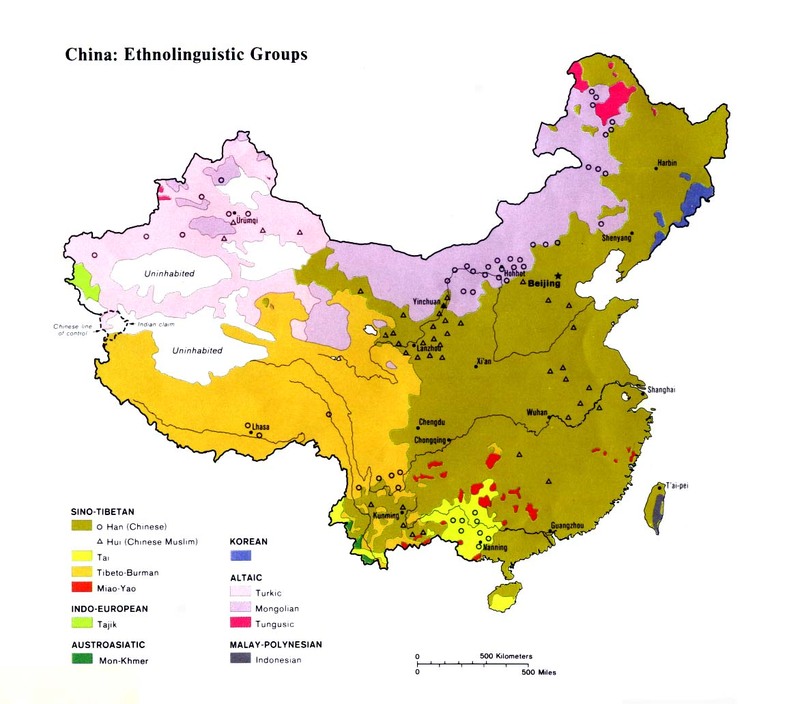 Many have been unable to distinguish between Han believers living in Inner Mongolia, and ethnic Mongols. View Mongol in all countries. 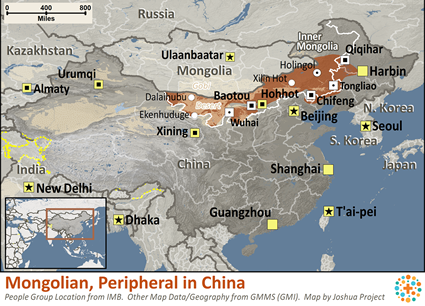 Location in Country: Almost six million Mongols are scattered across a wide area of northern China. Approximately three times as many Mongols live in China as in the nation of Mongolia. The population of Mongols living in Inner Mongolia fell from 450,000 to 300,000 in the 173 years between 1772 and 1945. Although their numbers have since grown again, they are now swamped by the multitude of Han who have migrated into their homeland. In 1982, 1,863 of China's 2,369 counties and municipalities contained members of the Mongolian nationality.